Take 1 teaspoonful (5 ml) daily. It can also be mixed in food and drinks. 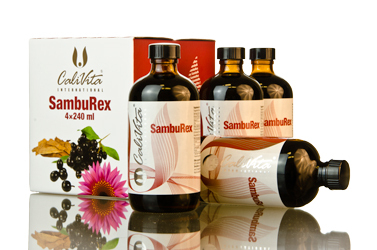 Elderberry (Sambucus nigra) is one of the herbs that have been used for the longest in popular medicine. It was the sacred German herb. It was viewed as some kind of panacea against all kinds of illnesses*, in other areas, primarily in cold weather, it has been used to strengthen the immune system, against coughs, as well as to promote digestion. Unfortunately nowadays only its flowers are used in most places for human consumption, mostly in the food industry as the raw material of syrups, for example. Few people know that its fruit, if adequately prepared, is also suitable for human consumption as it contains several precious active ingredients that may significantly contribute to the healthy functioning of our body. It is for example abundant in antioxidants such as: flavonoids, fruity acids, as well as vitamin A and C.
The other important component of the formula is a special herbal blend, which contains Echinacea and Astragalus,which is popular in Eastern medicine. 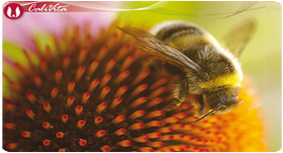 Echinacea (coneflower) is one of the most frequently used herbs to support the immune system, and is also suitable for helping to preserve the health of the lower urinary tract. It originates from North-America, and was one of the most important medicines of Indian natives. It has several known species with similar effects. 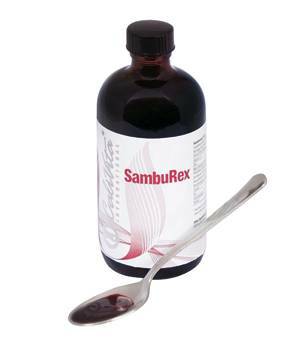 SambuRex contains two species of Echinacea, Echinacea purpurea and Echinacea angustifolia. Astragalus has been used for more than two thousand years in Chinese medicine, primarily to protect the immune system as well as to boost vitality and vital energy (Chi). In addition to the herbs, we have completed the formula withvitamin C and zinc as well, which may also contribute to the proper functioning of the immune system. The herbal active ingredients of the formula are present in a non-alcoholic extract, so it can be applied safely by those who drive a car or operate machines. As it is alcohol-free, it can be given to children although it is not recommended for children under one year of age. (see WARNING below). It is a pleasantly tasting, sweet liquid, which contains no added sugar, artificial sweeteners or artificial preservatives. It is not recommended for those sensitive to Cruciferae family. It is not recommended for children under the age of 1. Summer has supplied our body with lots of sunshine, fresh fruit and vegetables. However, as fall sets in we are forced to resort to other methods in order to make our defensive system combat pathogens as effectively as possible. One of the most delicate ways of prevention is offered to us by herbs tried and tested by traditional medicine. 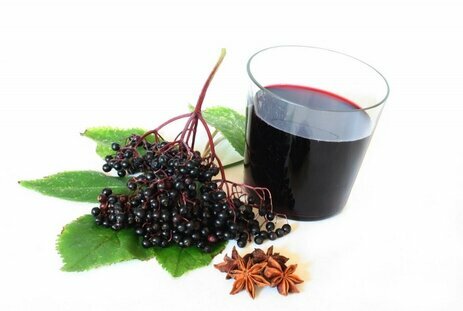 Elderberry (Sambucus nigra L.) is a shrub indigenous to Europe, America and Asia and its flower and the delicious syrup made from it are well-known to everyone. It is less known that its flavonoid-rich fruit may also be a useful addition to our home pharmacy as it has been used for centuries, characteristically against feverish conditions and cold, mainly for its diaphoretic and expectorant effects as well as to enhance digestion. As elderberry has proved to be a highly popular remedy, modern medicine started investigating if it can be an alternative or possibly complement often aggressive drug therapies of different diseases. In 2004 the effect of the plant was tested on patients suffering from flu-like symptoms, compared with a placebo (preparation containing no active ingredient). The results appeared to be promising. According to the surveys of the general condition of the patients as related by themselves, the period of the unpleasant symptoms reduced by as much as 4 days and they had to take significantly less medicine (for example antifebriles and painkillers) than their counterparts taking the placebo. Other studies have found it to be effective not only againstflu but it has also proved to act as an antibacterial against certain species of Streptococcus.. Further studies have justified the anti-inflammatory effects of elderberry extract. However, elderberry or its extract is primarily used against problems related to the upper respiratory tract, and it is good to know that we can also prepare a mild cathartic and diuretic from its fruit . The plant itself contains different antioxidant compounds in high concentration, such as vitamin A and C, so it can be a very effective aid in our combat against free radicals. 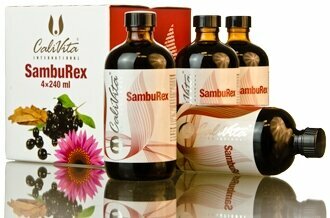 Elderberry can be of great help in colder months if combined with Echinacea, one of the most popular herbs. It has also been proved by studies that its active ingredients and flavonoid contents may boost the resistance of the body. Additionally, it possesses anti-inflammatory effects, moreover externally it has a property that stimulates the healing of wounds. Its antiviraleffects are still examined, but under experimental conditions where it has been reported to have had inhibiting effects on the herpes virus. This confirms age-old observations of popular medicine in the face of extraordinarily high standards of modern science. That which was efficacious according to the foxed pages in the days of our grandparents, is once again employed in modern medicine. So let us take advantage of this opportunity if we would like to use less chemicals and drugs! Szendrei-Csupor, Herb store: a guide to the application of herbs, Medicina 2009. Prof. Dr. Petri G. :Herbs and herbal formula sin therapy, Galenus Publisher, Budapest 2006. Rácz G., Rácz-Kotilla E., Szabó L. Gy. The basics of phytotherapy,Sanitas Természetgyógyászati Alapítvány, Budapest 1992.